As Father Ganguly was interested in entering the Congregation of Holy Cross, he was sent to the Novitiate of the Fathers of Holy Cross in Jordan, Minnesota, USA. After one year, on August 16, 1952, he made his Religious Profession and in October he returned to Dhaka. On his return, he was appointed a professor of Logic and English at Notre Dame College, founded by the Fathers of Holy Cross in Dhaka in 1949. In 1954, he became the Dean of Studies and, in 1958, the Vice Principal of the college. On March 21, 1960, at the sudden death of Father James L. Martin, CSC, Father Ganguly succeeded him as the principal. He was the first Bangali to hold the position. Students and other professors alike loved him and appreciated his skills. On September 13, 1960, Pope John XXIII nominated Father Ganguly as the Auxiliary Bishop of Dhaka, where Most Rev. Lawrence Leo Graner was the archbishop. He took Deus Adjutor Meus (God is my helper) as his motto. On October 7, 1960, Cardinal Gregory Peter Agaginian, Prefect of the Congregation for the Propagation of the Faith in the Vatican, consecrated Father Ganguly as the new local bishop. Hundreds of priests and Religious and thousands of Catholic faithful were present at the ceremony at St. Mary's Cathedral in Dhaka. It was a watershed event in the 400-year history of the Catholic Church in Bangladesh. In the early 1960s, there was a riot situation in the northern districts of the then East Pakistan (now Bangladesh) between Bangali Muslims and ethnic Garos (Mandis) and Hajongs. Due to land grabs and other forms of persecution, backed by provincial and local administrations, thousands of these minorities, mostly Christians, left their homesteads and became refugees in the Meghalaya State of India. Archbishop Graner, who was an Americn, had personally visited the affected areas at the initial stage and requested Governor Monem Khan (belonging to the Muslim League Party) in Dhaka to take immediate action before the situation gets worse. In spite of reminders, the government failed to take appropriate action. The archbishop then had to take recourse to publicizing the sad plight of these ethnic groups in his pastoral letter in the Pratibeshi, the diocesan Catholic newspaper published from Dhaka. The pastoral letter drew world attention in the United Nations in New York and Pakistan government was unhappy with Archbishop Graner. As a result, he was denied the renewal of his visa. He was told that he could leave the country but could not return. Moreover, Archbishop Graner's whereabouts within the country was under constant government surveillance. 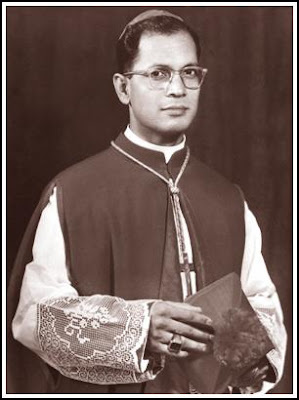 In such a suffocating situation, on July 6, 1965, Bishop Ganguly was named the Coadjutor Archbishop with the right to succeed the Archbishop of Dhaka. After Archbishop Graner left East Pakistan on November 23, 1967, Archbishop Ganguly took over the responsibility of the Archdiocese of Dhaka. When Archbishop Graner formally resigned from his position, Bishop Ganguly was installed as the new Archbishop of Dhaka. He was the first Bangali Archbishop, too. As the Archbishop, he made an enormous contribution to the Catholic Church in Bangladesh as a whole and the Archdiocese of Dhaka in particular. In thick and thin, he carried out his responsibilities relentlessly. This burden of responsibility was affecting him physically, too. On September 2, 1977, Archbishop Theotonius Amal Ganguly died of a sudden heart failure at the age of 57 years. The Christian community of Bangladesh was shocked to learn of the untimely death of their dear archbishop. Condolences were offered from within the country and abroad. On September 4, 1977, Bishops, foreign ambassadors, government officials, hundreds of priests and Religious, and thousands of people of all faiths were present at his funeral at the Archbishop's House, Dhaka. All of them were grieving the death of a holy man. I am happy at the concrete initiative taken for the canonization process of Archbishop Theotonius Amal Ganguly, who will ultimately receive a profound recognition for his holy and virtuous life. May he be a beacon of light and hope for people of all faiths.